The range of Swoke e-liquids is of 100% French design and manufacturing. Exclusively made from natural flavours, a plant-based base with natural extracts of nicotine (L-Nicotine). 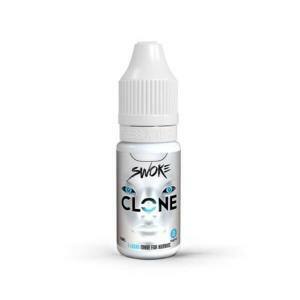 The Swoke E Liquid is a liquid whioch is 100% Natural from the french Brand. This liquid for the Electronic Cigarette is made exclusively of a base of natural aromas also 100% Vegetable and the Nicotine version which is created with natural Nicotine extracts (L-Nicotine). Products of high quality and the traceability assured the natural e liquids by Swoke are also rich and savoury juices. Principally fruity (Vinyl, Rendez-Vous, Pixel, Smiley...), the natural e liquids Swoke are also in the gourmet form, with Caramel Custards (Metro) or the gourmet liquids with a candy flavour of e liquid Bisou. Order your 100% Natural E Liquid with Le Petit Vapoteur. Be seduced with the Swoke E Liquid and the range of natural, unique and flavoured e liquids? Benefit with the advantages of the Le Petit Vapoteur to test the juices. We propose to you on this page the advantage prices and delivery under 48H if you order 100% Natural E Liquid from now. And, from 59.90€ we offer the delivery charges. So take advantage of your filling up your stock or for changing your equipment/materials.